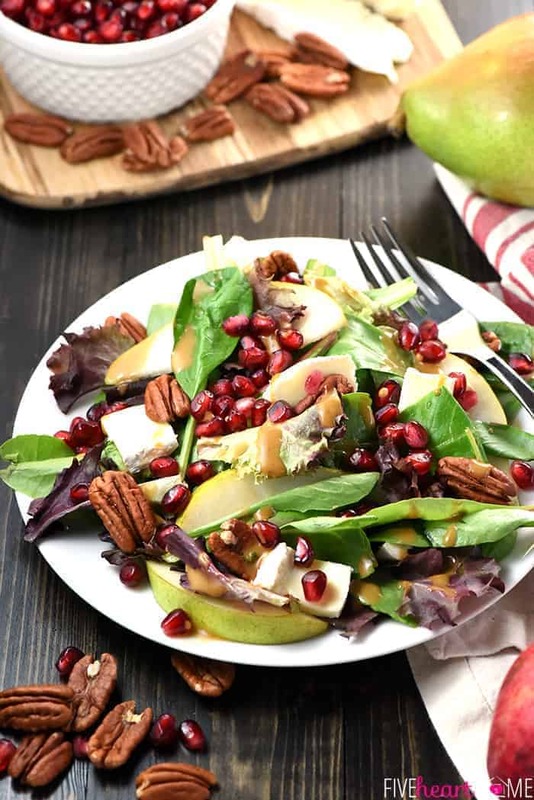 Thanksgiving Salad is a gorgeous, vibrant addition to any menu, bursting with pomegranate, pears, pecans, & brie and dressed with a homemade balsamic vinaigrette! I’m a sucker for a loaded salad. The more contrasting flavors and textures, the better. And if it’s a pretty salad, to boot? Can’t be beat. 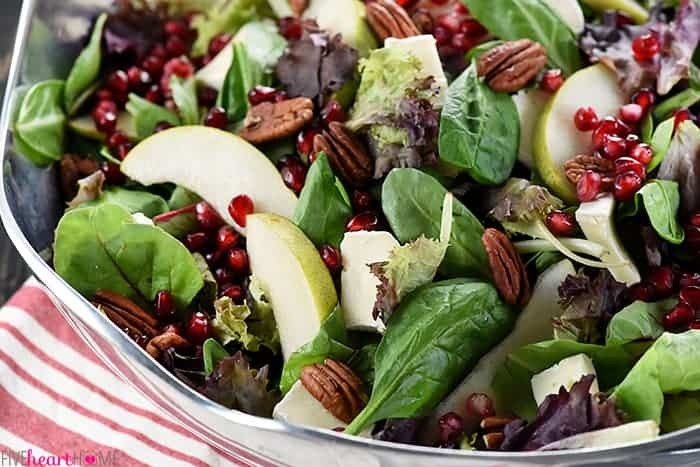 This time last year, I concocted a festive red-and-green Holiday Honeycrisp Salad using some of my favorite salad ingredients. 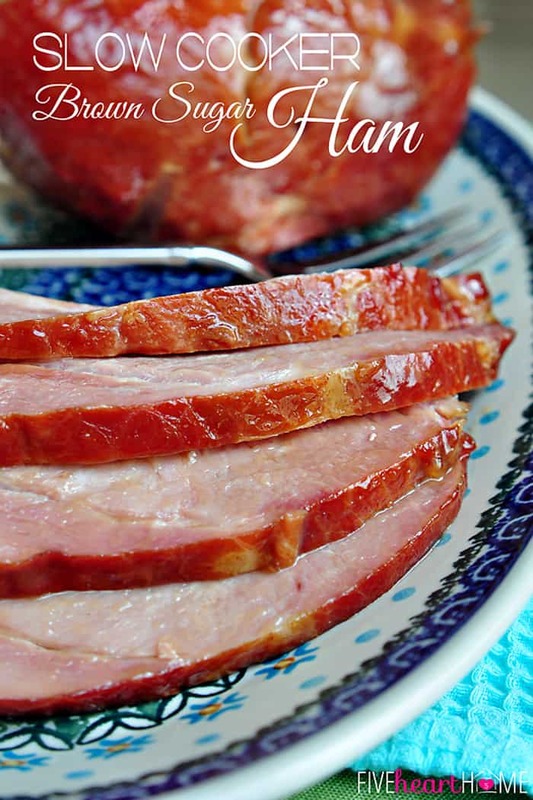 And, lo and behold, y’all seemed to agree that it was both beautiful and delectable, as it quickly became one of Five Heart Home’s most-pinned recipes on Pinterest. That salad immediately became our new family Christmas dinner tradition as well. So this year, I decided that our Thanksgiving table also needs a new tradition: a fresh, vibrant salad to lighten up all of the buttery Sweet Potato Casserole and Bacon-Wrapped Green Beans and Creamy Cheesy Corn. And since I can’t resist a combination of fresh mixed greens, sweet fruit, crunchy nuts, salty cheese, and zesty vinaigrette, I decided to start with those ingredients as my template. 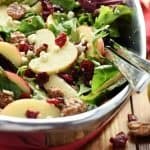 Since my other holiday salad centered around apples, I decided to make juicy pears the star of this Thanksgiving Salad. 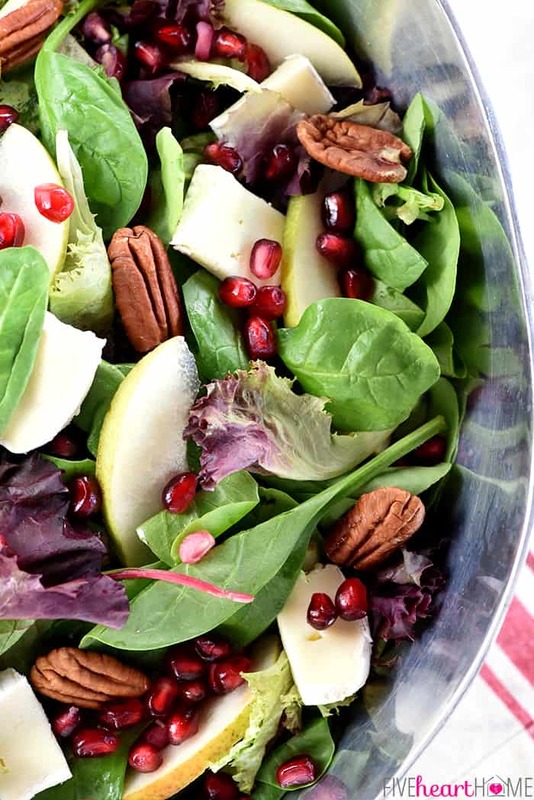 The thinly sliced pears are complemented by ruby-red pomegranate seeds, speckling the salad like little jewels (seriously…aren’t they so pretty?!). Since pears and pomegranates are already sweet, I decided to forgo my usual beloved candied nuts in favor of simple toasted pecans. 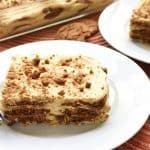 Just promise me you won’t skip the toasting, as it makes the pecans extra crunchy and brings out a deep, nutty flavor. 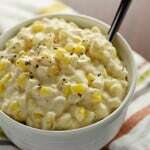 As for the cheese, I wanted to branch out from crumbled Feta or blue cheese, which are my typical salad choices. I’ve had a recent (and heavy) obsession with Brie, and it turned out that little pieces of this creamy, salty, soft cheese were the perfect balance to the zippy greens, fresh fruit, and toasty nuts. 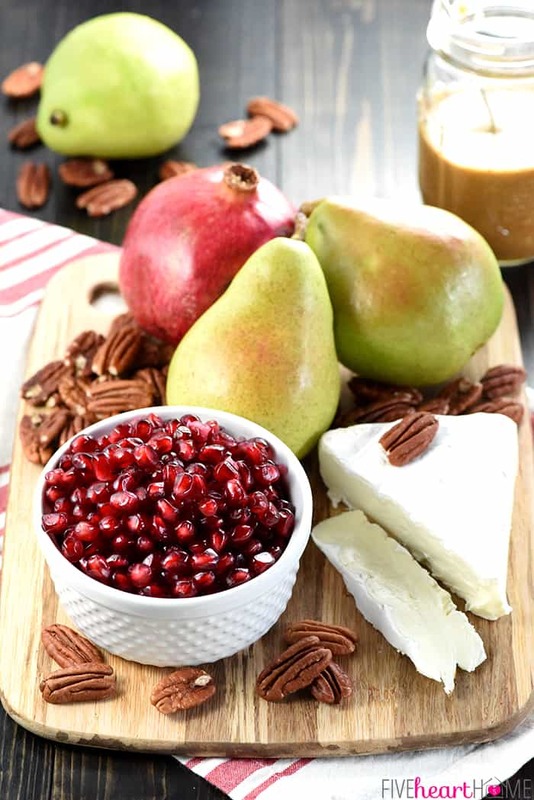 This gorgeous Pomegranate, Pear, Pecan, & Brie Salad with Homemade Balsamic Vinaigrette is loaded with vibrant colors and flavors and contrasting textures. 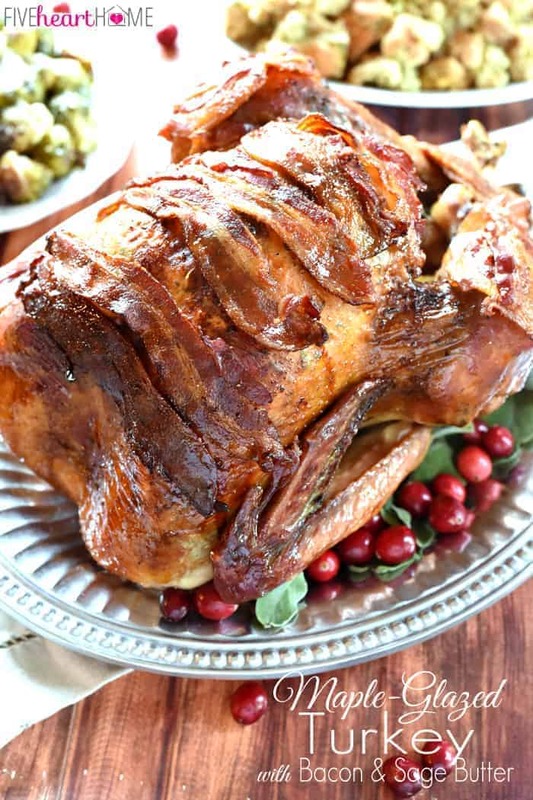 It would be the perfect addition to your Thanksgiving or Christmas holiday table, or it would make any dinner special! 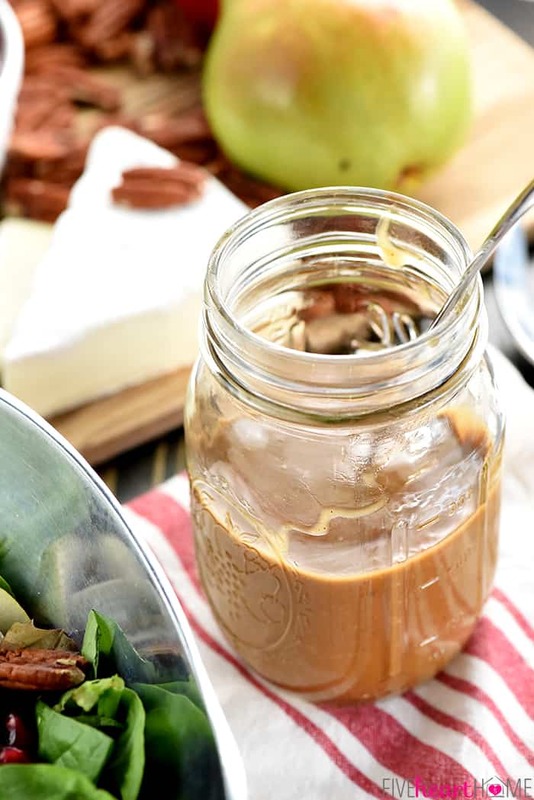 To prepare Balsamic Vinaigrette, measure all of the ingredients into a mason jar. Tightly screw on the lid and shake vigorously until everything is thoroughly combined. Alternatively, you may briskly whisk the ingredients together in a medium bowl, or blend them in a blender or mini food processor. Immediately after cutting the pear slices, place them in a large plastic baggie and squeeze fresh lemon juice over them. Close bag and gently shake to coat. 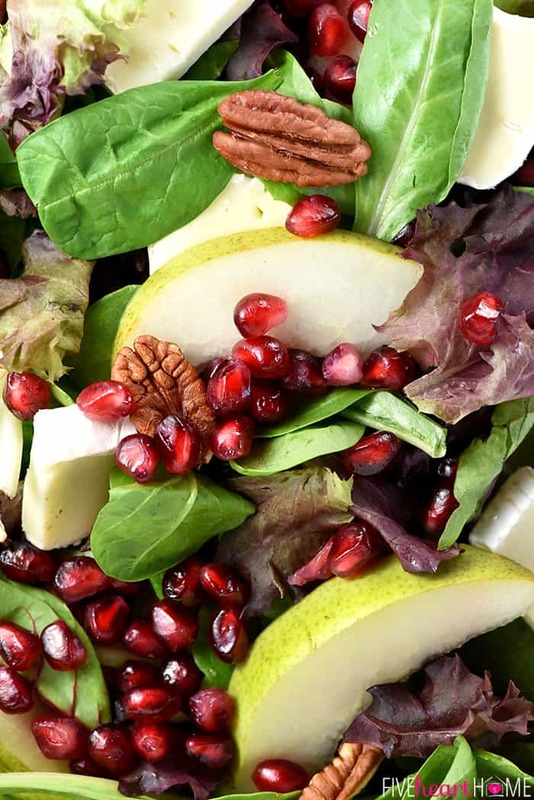 In a large salad bowl, layer salad greens, pear slices, pieces of Brie, pomegranate seeds, and toasted pecans. Just before serving, dress with desired amount of Balsamic Vinaigrette and toss until salad ingredients are evenly coated. If you use a really good balsamic vinegar, 1 teaspoon honey should be sufficient. However, you can always add a bit more honey, to taste, if you wish. I've made this dressing before when I was out of fresh garlic (oh, the horror! ), but I substituted 1/2 teaspoon garlic powder and it still turned out great. To toast the pecans, preheat the oven to 350°. Spread the pecans on sheet pan and bake for 8 to 10 minutes or until fragrant and lightly toasted, watching carefully to prevent burning. Allow to cool before adding to the salad. You may use your favorite variety of pears in place of D'Anjous...just make sure that the pears you choose aren't overly soft or ripe. 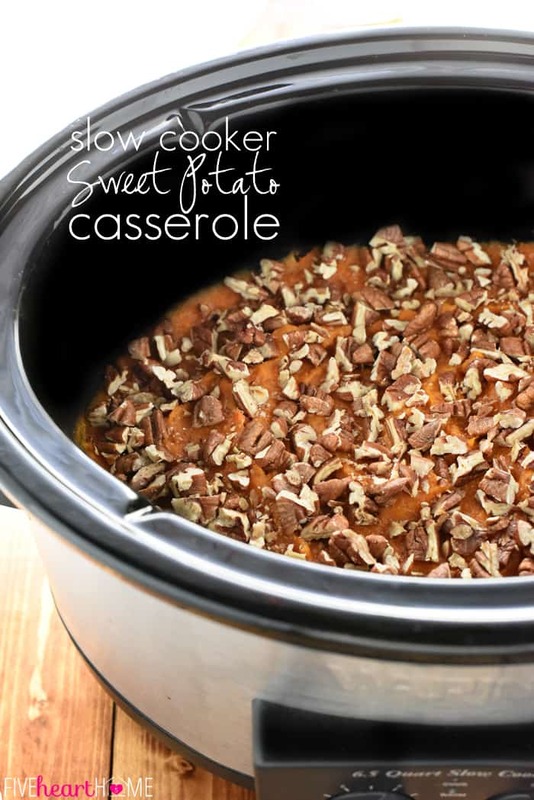 This recipe can easily be cut in half in the event that you're not feeding a small army. 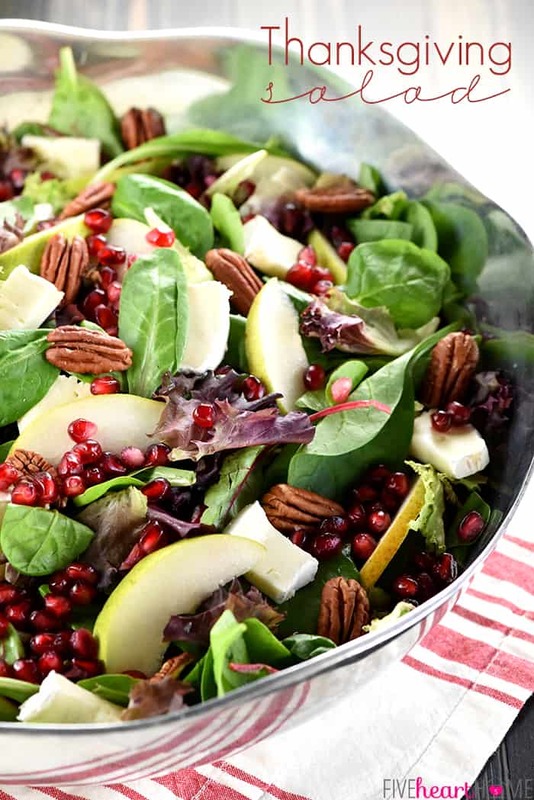 This Thanksgiving salad-pomegranate-pear-pecan -brie salad with the wonderful homemade dressing made my mouth water. 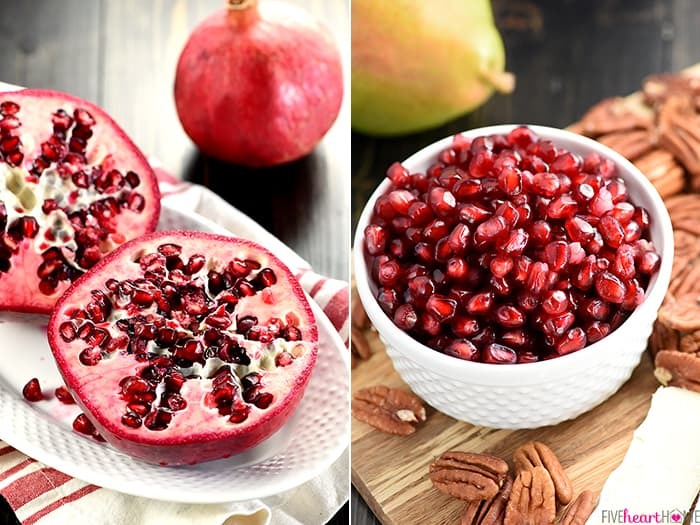 I love pomegranate seeds and they do look like tiny rubies but taste much better! I think I have found a new Christmas Salad. Thank you for sharing with us. I think this is the prettiest salad I’ve ever seen! 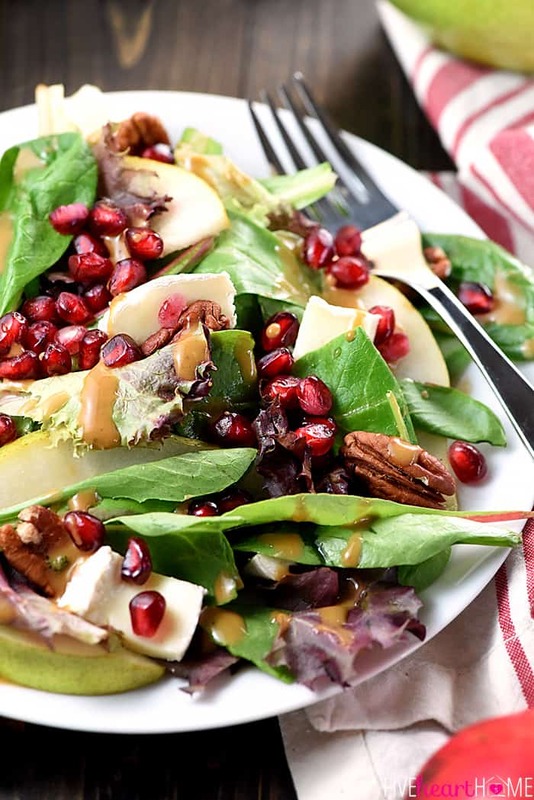 I am so excited to make this and I absolutely have fallen in love with the pomegranate in the salad. It so festive and the color just makes the salad gorgeous on the table! 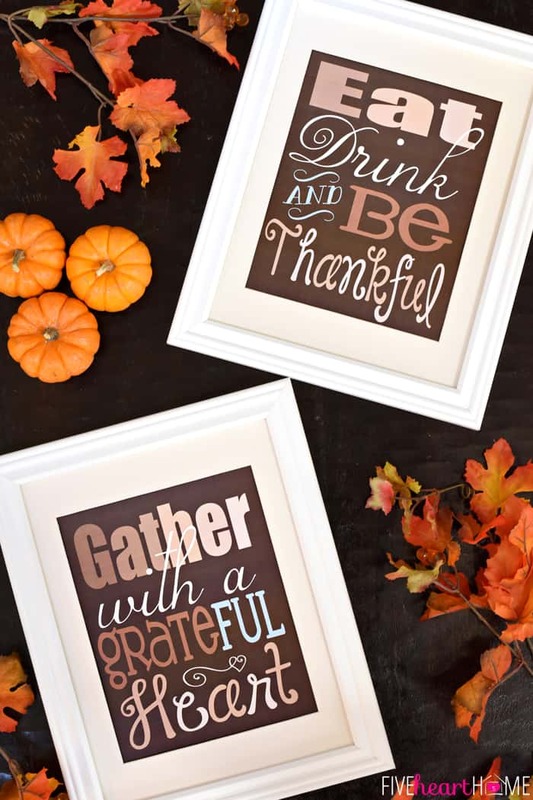 Happy Thanksgiving and thank you for sharing. 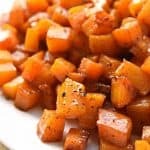 Hi Samantha, this salad recipe caught my eye so I made it for my cousin’s Thanksgiving dinner. 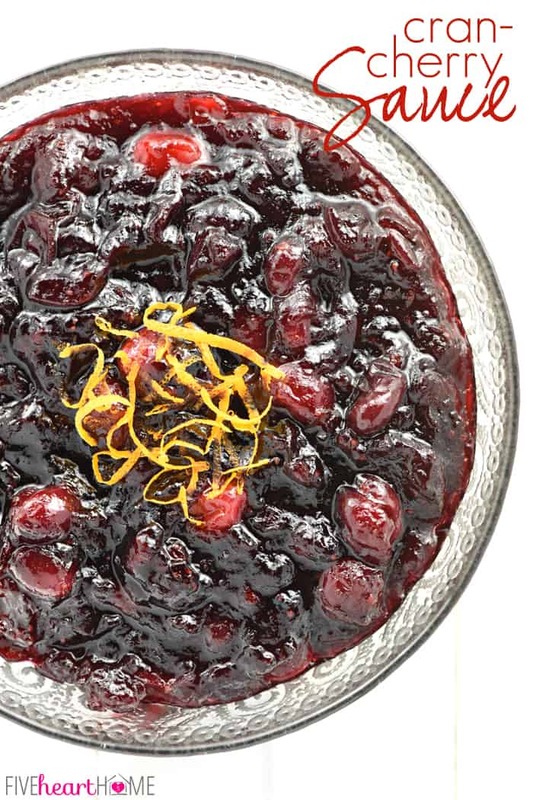 It was delicious and a festive addition to a sumptuous feast! I also ordered your slow cooker cookbook on Amazon and look forward to trying the tasty recipes that have healthy ingredients. I made your salad for “Friendsgiving” and it was a huge hit! Thanks for the recipe! Cannot wait to try this out for Christmas! Thank you so much for sharing. Hope it’s a hit, Cynthia, and that you have a wonderful Christmas! Hi, I just made this salad for my daughter’s bridal shower and it was a big hit. I found working with the Brie problematic due to it being very soft and sticky. Am I missing Something with how to work with it? I agree it tastes wonderful with the ingredients and would use it again, except for the stickiness factor! Any suggestions how to make t easier? Hi Mary! So glad this salad was a hit at your daughter’s bridal shower! Some brands or varieties of Brie are stickier than others, but the colder the Brie is, the easier it should be to slice. So I’d recommend popping it in the freezer for 20 minutes or so before slicing it. It can then come to room temperature in the salad. Hope that helps! Hi Amerberly! Shaking in lemon juice should keep the pears from browning for at least a few hours, but if you’d like to prep the salad even more ahead of time, I found this tip from America’s Test Kitchen about soaking the slices in honey water! Soaking slices for a few minutes in a solution of lemon juice + water (or even Sprite) should also help delay browning, as opposed to just quickly shaking with lemon juice. Hope that helps! Hi! Can I make the dressing a few days ahead of time? Yes! 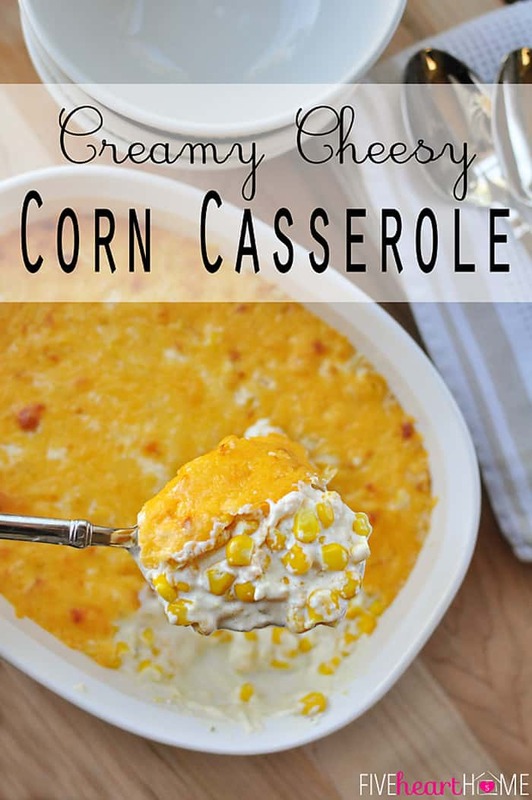 Just store it in the refrigerator, and then allow it to come to room temperature and shake well before serving. Hope you enjoy!